Social media has become an important part of how fans consume sports. With the rise of Twitter, players are more accessible than ever before. Twitter accounts can also be a way for players to express their individuality and creativity. Many players choose to go with a pretty straightforward version of their name as their handle, but others decide to get a bit more creative with it. It is time for my second annual Twitter handle power rankings on the Nebraska football team. Four players from last year’s list – De’Mornay Pierson-El (@DontPunt_15), Joshua Kalu (@BluesKalus), Jake Kitten (@The_Big_Cat67), Keyan Williams (@Primetime_IX) – moved on which opened the door for new players to cack the rankings. Sadly, Kalu’s graduation means this year’s edition is lacking in Blue’s Clues references, but there is still plenty of fun. 1. JoJo Domann, Sophomore, Safety (@TheDomannator): Domann missed all of last season with two torn ACLs but he is back now and pushing for playing time, and he retains his spot atop my rankings. With a name like Domann, you don’t have to think too hard to come up with something, but I’m not punishing him for that. If you’ve seen Domann play, whether it be on defense or special teams, you’d understand why his handle is so apt. He’s a physical player who is always around the ball and looking to lay the big hit. 2. Mick Stoltenberg, Senior, Nose Tackle (@big_MICKet): This one works on a variety of levels. First, if you were to ever stand next to Stoltenberg, “big” is probably the first word that would pop into your head. The newly-named team captain is a very large man, listed at 6-foot-5 and 315 pounds. Going with the all caps only stresses that point and is appropriate. As a hoops junkie, I also love the reference to Kevin Garnett, “The Big Ticket.” With Nos. 2 and 3 vacating the list, the Big Micket moves up the list. 3. Broc Bando, Redshirt Freshman, Offensive Lineman (@73Broccoli): Simple, yet brilliant. Broc Bando is a tremendous name to begin with. There’s a lot you can do with Broc, and I appreciate him going the vegetable route. The number here is the key, though, as it works on multiple levels. First, his number at Nebraska is actually 73, and second, 73 rhymes with broccoli. 73 Broccoli just has a nice ring to it, and so it moves up the rankings. 4. Guy Thomas, Redshirt Freshman, Outside Linebacker (@17sackmangt): Thomas’ handle is one that I missed last season for whatever reason, but it is another one that is very appropriate for the kind of player he is. Sackman GT. Thomas’ pass-rush prowess when he first arrived in Lincoln had him on the path to playing as a true freshman, but Mike Riley and Bob Diaco ultimately changed their minds and redshirted him last season. He’s still learning the outside linebacker position at Nebraska but had 14 sacks as a senior at powerhouse Booker T. Washington High School in Florida. Better use of capitalization would make the handle easier to read at first glance and I’m not sure where the 17 came from as he wore No. 11 in high school and is wearing No. 18 now, but it’s still a solid handle. 5. Adrian Martinez, Freshman, Quarterback (@MartinezTheQB): Adrian Martinez may be the only scholarship quarterback left standing in Mario Verduzco’s room (at least the only one who is eligible), but he had this handle long before that was the case and Tristan Gebbia’s transfer only makes it that much more appropriate. He’s not A quarterback, he’s THE quarterback. 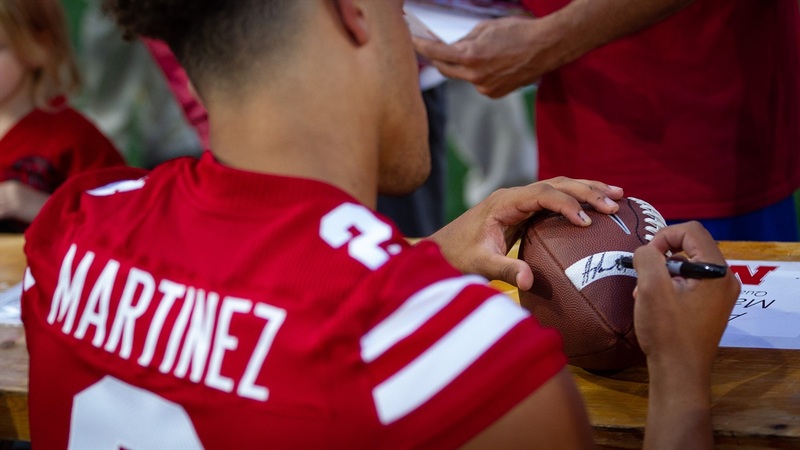 Assuming health and him living up to expectations, winning the starting job from day one after being hand-picked by Scott Frost to start his rebuild in Lincoln means Martinez is in line to start every game he plays in at Nebraska. 6. Tate Wildeman, Freshman, Defensive End (@tatethegreat68): Similar to Bando’s handle above, we have another word/number rhyme here. If you’ve seen the 6-foot-5, 275-pounds freshman in person “Tate the Great” seems applicable. However, Wildeman’s number at Nebraska is 92 and in high school it was 9, so unlike Bando, no bonus points for the number outside of the rhyme. 7. Ethan Cox, Freshman, Wide Receiver (@coxandthehound): Here’s a player referencing a childhood favorite, The Fox and the Hound. It’s appropriate as well, as the preferred walk-on’s playing style could be described as “clever like a fox.” He’s a good athlete with good quickness who played quarterback in high school but made a name for himself at cornerback during the spring and fall. 8. Cam’Ron Jones, Freshman, Safety (@camgonework15): There isn’t a whole lot of room for creativity with the surname Jones, but he went away from that entirely regardless to instead send a message about what he is here to do: work. 9. Dicaprio Bootle, Sophomore, Cornerback (@_flightsdelayed): If there is any player on the roster who would be justified in simply using his name as his handle, it’s Dicaprio Bootle. However, he opted against that and instead went with a variation of the “no fly zone” theme for cornerbacks. Props for finding a new angle, but I do have to dock him a few points for playing off of his position and playing style rather than his name. 10. John Raridon, Sophomore, Offensive Guard (@hines_bittleman): I still have no clue what this means but Raridon still wins for the most random handle on the team.